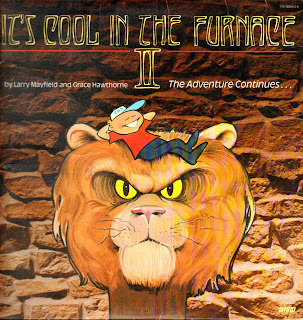 I wanted to put the original "It's Cool in the Furnace" up here, but it looks to be available here as part of a 35th anniversary re-release (and is recommended as probably one of the better Christian musicals for kids), so instead here's the little known sequel. It really has nothing to do with the story of Shadrach, Meshach and Abednego, but it does continue the story after that with Daniel, culminating in his adventure in the lion's den. This has got some pretty catchy tunes in it as well, and I hope you like it! Could you put up the original "It's Cool in the Furnace"? I bought the 35th anniversary addition, but it is different from the original (different singers, etc.) I much prefer the original! It brings back such great childhood memories! Yup... Just like the anniversary release of Dottie Rambo's Creekbank... a totally re-done edition. Most of us would prefer the original. Uhh...I think you meant Daniel not David.